I recently had the opportunity to attend the EBSD 2016 meeting, the 5th topical conference of the Microanalysis Society (MAS) in a series on EBSD, held this year at the University of Alabama. This is a conference I am particularly fond of, as I have been able to attend and participate in all 5 of these meetings that have been held since 2008. This conference has grown significantly since then, from around 100 participants in 2008 to around 180 this year. This year there were both basic and advanced tutorials, with lab time for both topics. There have also been more opportunities to show live equipment, with demonstrations available all week for the first time. This is of course great news for EDAX, but I did feel a little badly that Shawn Wallace, our EBSD Applications guru in the US, had to stay in the lab while I was able to listen to the talks all week. For anyone interested or concerned, we did manage to make sure he had something to eat and some exposure to daylight periodically. This conference also strongly encourages student participation, and offers scholarships (I want to say around 70) that allow students to travel and attend this meeting. It’s something I try to mention to academic users all the time. I’m at a stage in my career now that I am seeing that people, who were students when I trained them years ago, are now professors and professionals throughout the world. I’ve been fortunate to make and maintain friendships with many of them, and look forward to seeing what this year’s students will do with their EBSD knowledge. There were numerous interesting topics and applications including transmission-EBSD, investigating cracking, both hydrogen and fatigue induced, HR-EBSD, nuclear materials (the sample prep requirements from a safety perspective were amazing), dictionary-based pattern indexing, quartz bridges in rock fractures, and EBSD on dinosaur fossils. There were also posters on correlation with Nanoindentation, atom probe specimen preparation, analysis of asbestos, ion milling specimen preparation, and tin whisker grain analysis. The breadth of work was great to see. 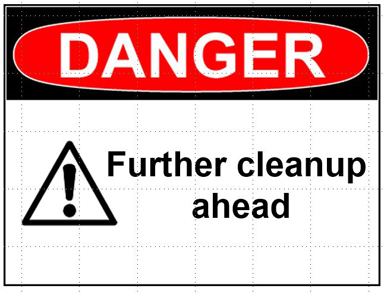 The danger here, of course, is that further cleanup will change the orientations away from the initial measurement. This has to be done with care and consideration. I mention all this because at the EBSD 2016 meeting, I presented a poster on NPAR and people were asking about the difference is between NPAR and standard cleanup. I thought this blog would be a good place to address the question. As an experiment, I used our Inconel 600 standard (nominally recrystallized), and found a triple junction. I then collected multiple patterns from each grain with a fast camera setting with corresponding lower SNR EBSD pattern. Representative patterns are shown below. Now if one averages patterns from the same grain with little deformation, we expect SNR to increase and indexing performance to improve. Here is an example from 7 patterns averaged from grain 1. Figure 4: Frame Averaged Example. That is easy though. Let’s take a more difficult case, where with our hexagonal measurement grid averaging kernel, we have 4 patterns from one grain and 3 patterns from another. The colors correspond to the orientation maps of the triplet junction shown below. In this case, the orientation solution from this mixed averaged pattern was only 0.1° from the pattern from the 1st grain, with this solution receiving 35 votes out of a possible 84. What this indicated to me was that 7 of the 9 detected bands matched this 1st grain pattern. It’s really impressive what the triplet indexing approach accomplishes with this type of pattern overlap. Here the orientation solution misoriented 0.4° from the pattern from the 1st grain, with this solution receiving 20 votes out of the possible 84. This indicates that 6 of the 9 detected bands matched this 1st grain pattern. 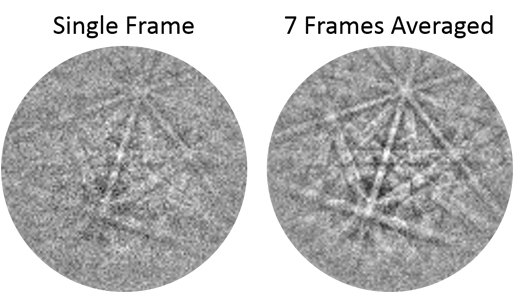 These example do show that we can deconvolute the correct orientation measurement from the strongest pattern within a mixed pattern, which can help improve the effective EBSD spatial resolution when necessary. Now, to compare NPAR to traditional cleanup, I then set my camera gain to the maximum value, and collected an OIM map from this triple junction, with an acquisition speed near 500 points per second at 1nA beam current. I then applied NPAR to this data. Finally, I reduced the gain and collected a dataset at 25 points per second at the same beam current as a reference. The orientation maps are shown below with corresponding Indexing Success Rates (ISR) as defined by the CI > 0.1 fraction after CI Standardization. This is a good example of how clean up can be used to improve the initial noisy data, as NPAR provides a new alternative with better results. We can clearly see that the NPAR data correlated well with the slower reference data with the NPAR data collected ≈ 17 times faster than the traditional settings. Now let’s see how clean up (or noise reduction, although I personally don’t like this term as often we are not dealing with noise-related artifacts) compared to the NPAR results. To start, I used the grain dilation routine in OIM Analysis, which first determines a grain (I used the default 5° tolerance angle and 2 pixel minimum defaults), and then expands that grain out by one step per pass. The results from a single pass, a double pass, and dilation to completion (when all the grains are fully grown together) are shown below. If we compare this approach with the NPAR and As-Collected references, we see that dilation cleanup has brought the 3 primary grains into contact, but a lot of “phantom” artifact grains with low confidence index are still present (and therefore colored black). The other clean up routine I will commonly use is the Neighbor Orientation Cleanup routine, which in principle is similar to the NPAR neighbor relation approach. Here, instead of averaging patterns spatially, from each measurement point we compare the orientation measurements of all the neighboring points, and if 4 of the 6 neighbors have the same orientation, we change the orientation of the measurement point to this new neighbor orientation. Results from this approach are shown here. Figure 9: Neighbor Orientation Correlation. Now of course the starting data is very noise, and was intentionally collected at higher speeds with lower beam currents to highlight the application of NPAR. With initial data like this, traditional clean up routines will have limitations in representing the actual microstructure, and this is why we urge caution when using these procedures. However, clean up can be used more effectively with better starting data. To demonstrate this, a single pass dilation and single pass of neighbor orientation correlation was performed on the NPAR processed data. These results are shown below, along with the reference orientation map. In this case, the low confidence points near the grain boundary have been filled with the correct orientation, and more of the grain boundary interface has been filled in, which would allow better grain misorientation measurements. When I evaluate these images, I think the NPAR approach gives me the best representation relative to the reference data, and I know that the orientation is measured from diffraction patterns collected at or adjacent to each measurement point. I think this highlights an important concept when evaluating EBSD indexing, namely that one should understand how pattern indexing works in order to understand when it fails. Most importantly, I think (and this was also emphasized at the EBSD 2016 meeting) that it is good practice to always report what approach was used in measuring and presenting EBSD data to better interpret and understand the measurements relative to the real microstructure. ← From Third World to First World – Through Innovation, Technology and Manufacturing.